The Battleground Series is now well-established with more than 140 titles in print. This addition to the series maintains the very high standard set by the series. It includes a great many images in support of the text. The combination of thorough research and clear writing has produced a comprehensive work that can be used as a battlefield guide, or as a detailed historical account that will grace any WWI library. By using logical headings, the author has given detailed information that can be read and used to aid a visit to the battleground. At the same time, it makes the book more readable for the armchair historian. DESCRIPTION: The Battleground Series is now well-established with more than 140 titles in print. This addition to the series maintains the very high standard set by the series. It includes a great many images in support of the text. 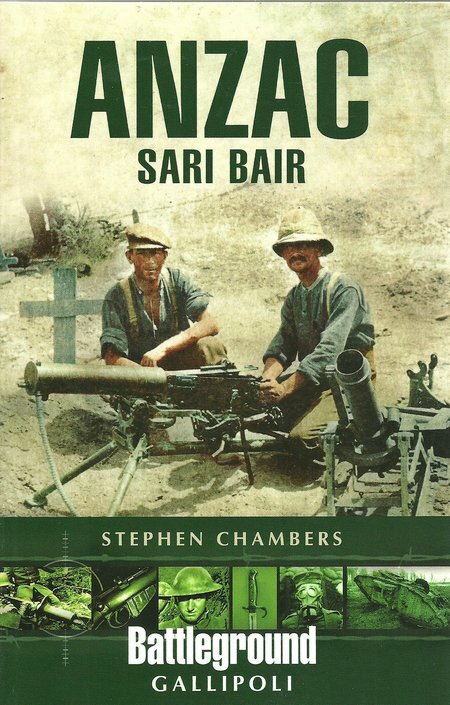 The combination of thorough research and clear writing has produced a comprehensive work that can be used as a battlefield guide, or as a detailed historical account that will grace any WWI library. The author presents one of the critical battles in a campaign that many have judged a mistake and catastrophic failure. In the ‘what-if” game of history, the objective at Gallipoli was to neutralize Germany’s ally, Turkey, and open a warm water route to support Russia. The stakes were very high but the campaign was poorly supported, rather than being neglected in the planning. What began as a clearly defined naval campaign, was stretched into an amphibious landing, then expanded as more troops were thrown into the battle until half a million were committed. Some will argue that a full and carefully defined plan, adequately supported with resources for the first waves of landing and the break-out phase would have succeeded. By adding stages to the original naval campaign, and scraping additional resources to bolster the attack, the campaign never achieved critical mass. There have been a number of opposing theories presented over the years since the 1916 evacuation of forces. In the narrow military view, inadequate forces were initially committed and they were not resourced for a rapid breakout from the landing beaches. That allowed the Turks to reinforce the initial meagre defenses and control the heights, preventing the Allied troops from advancing up the Gallipoli Peninsular to threaten Constantinople. How much was a resource issue and how much was a command issue will long be debated, as will the timing of the evacuation. Some will claim that the evacuation was delayed, resulting in much higher casualties, but others will claim that the evacuation was not necessary and more resources should have been allocated to achieve victory. What cannot be disputed is the courage of Allied troops who were awarded 39 Victoria Crosses. Also, it cannot be disputed that the Australian and New Zealand troops, who made up much of the force, attempted to advance with great determination. The main area of debate is over the political and command decisions that ended with resignations, dismissals and the fall of the Liberal Government. Perhaps the real failure resulted from the failure to see the opportunities strategically and the failure to plan a complete campaign with a clear set of objectives, for which troops could be trained and with reserves supplies assembled to support the landings moved close to the area where they would be delivered. As it was, the campaign was opportunistic, the ANZAC force being committed because it was not committed elsewhere and increasing numbers of troops were required because the Turks continued to resist. It became a matter of honour to win because casualties already racked up and the refusal of the field commander to accept that his initial plans had been shown wanting. However, that was the story of WWI on both sides, with the Western Front absorbing massive resources because no one could think of a reliable alternative and too many reputations were at stake. What may have added to the problems was the reluctant acceptance of the high casualty rate on the Western Front. This made the casualty rate at Gallipoli look much less alarming by proportion. It assisted those against evacuation, because withdrawal was seen in the context of the Western Front, where an evacuation of British troops would have led to the defeat of France and even of Britain. The situation in Gallipoli was of course very different and the reduction of casualties by an earlier evacuation would not have had the same consequences.